Oklahoma City real estate investing has seen a lot of ups and downs in the years following the recession. However, thanks in part to the expansion of the economy, and in particular the oil industry, local housing is doing very well for itself. Things appear to be in a sustainable, upward trajectory for the time being. With home prices averaging $152,900; the Oklahoma City real estate market is considerably behind the national average. In fact, Oklahoma City homes are about $55,000 less than the national average. The difference is largely the result of recent appreciation rates. While prices in the Oklahoma City real estate market continue to grow relative to last year, they are not on pace with the rest of the country. Over the course of a year, homes in Oklahoma City have appreciated at a rate of 2.5 percent, less than half the national average. It isn’t until you look back at least three years, however, that you discover the significant difference in home prices. Over the last three years, Oklahoma City homes have appreciated just 6.9 percent, whereas the national average was above 28 percent. Homes purchased in the Oklahoma City housing market one year ago have appreciated, on average, by $5,975. The national average was $14,170 over the same period. Homes purchased in the Oklahoma City housing market three years ago have appreciated, on average, by $17,056. The national average was $53,857 over the same period. Homes purchased in the Oklahoma City housing market five years ago have appreciated, on average, by $26,927. The national average was $48,036 over the same period. Homes purchased in the Oklahoma City housing market seven years ago have appreciated, on average, by $30,465. The national average was $13,870 over the same period. Homes purchased in the Oklahoma City housing market nine years ago have appreciated, on average, by $52,060. The national average actually decreased by as much as $2,822 over the same period. Oklahoma City real estate investing owes a lot of its success to the local economy and job market. The recent oil boom has the region in a position to succeed in the immediate future. With that said, the job market should continue to support supply and demand within the housing sector. Recent data suggests that the unemployment rate in Oklahoma City is as low as 3.6 percent. That is two whole percentage points lower than the national average, and experts think it will only improve in the coming months. In fact, the only facet of the Oklahoma City job market more promising than the unemployment rate may be job growth. At 3 percent, 1-year job growth is well about the national average and expected to continuing in an upward direction. For all intents and purposes, the job sector is supporting the Oklahoma City real estate market. As if a thriving job sector wasn’t enough, Oklahoma City has one additional indicator working in its favor: affordability. The monthly mortgage payment to income ratio is considerably less in the Oklahoma City housing market. Homeowners in the area can expect to use about 7.4 percent of their income on monthly mortgage payments, about half of the national average. The average homeowner in the United States allocates more than 15 percent of their income to mortgage payments. With affordability higher than historical averages and a thriving job sector, Oklahoma City is expected to see an influx of younger buyers. The presence of Millennials alone may provide enough activity to help Oklahoma City lead in the recovery. The Oklahoma City real estate investing industry should pay close attention to foreclosures in the area. In fact, RealtyTrac acknowledges approximately 670 properties that are in some stage of foreclosure. February actually saw foreclosure filings increase 69 percent from the beginning of the year. However, year-over-year, foreclosures are actually down 23 percent. Oklahoma City real estate investors should know that distressed properties are nearly half the price of non-distressed ones. The median sales price of a foreclosure home was $58,000, or $55,500 less than the average non-distressed property. Most of the foreclosures in the Oklahoma City real estate market are of the auction variety. At 75 percent, the majority is going to be placed up for auction. Bank-owned foreclosures round out the rest, which are actually down about 30 percent from the previous year. Auction foreclosures, on the other hand, have only increased a modest 3.1 percent on the year. There is certainly no lack of activity in the housing industry. There are about 1,487 homes for sale in the Oklahoma City housing market, compared to 5,797 that recently sold. Of those neighborhoods that made the list, Quail Creek and Mesta Park received the most nods. However, outside of the most popular neighborhoods, Helm Farm deserves some consideration. In a one-week period, the average listing price in Helm Farm increased nearly 60 percent. This particular neighborhood may provide entrepreneurs with a prime Oklahoma City real estate investing opportunity. The Oklahoma City real estate market has every right to be excited for the direction it is heading. While not quite on pace with the rest of the country, it has come a long way in the face of significant headwinds. Market indicators, including affordability and a booming job sector, should make it a great place to invest. 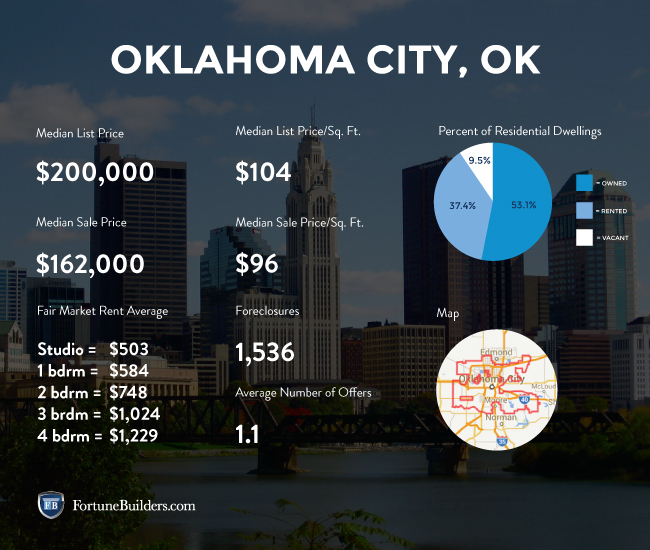 The Oklahoma City real estate market has come a long way since we last checked in on it, and Oklahoma City real estate investing couldn’t be in a better place because of it. The median home price for the area has increased, and is now sitting at approximately $156,300. While a far cry from the national average, it shows signs of strong improvement. What is even more impressive, however, is the city’s rate of appreciation. Homes in Oklahoma City have appreciated at a rate of seven percent in the last year. That is nearly a five percent increase from the beginning of this year. 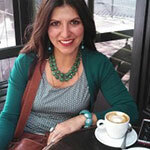 Surprisingly, foreclosures have increased significantly, and are now at 1,551 units, according to RealtyTrac. Those interested in Oklahoma City real estate investing should take note, as these properties could come at an intriguing discount. For the most part, the Oklahoma City real estate market has made strides to keep up with the recovery. While it has a long way to go till it is on pace with national averages, it is doing very well in its own right. Courtesy of Fortune Builders Inc.